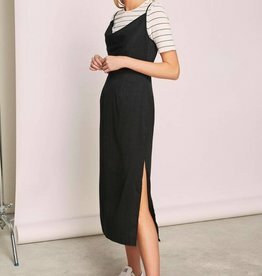 You need this dress! The Ivy Stripe Long Sleeve Dress is the ultimate sweet girl vibes! The ultimate versatile wardrobe piece. The Fountain Jumpsuit is perfect for date night- or any night! Pair with a cute set of heels & earrings and you've got your next date night outfit sorted! 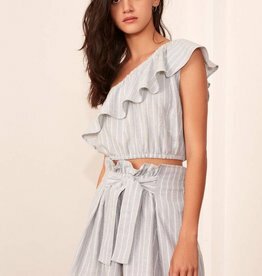 This high waisted wrap front skirt features a ruffle hem and pairs perfectly with the Sequence Stripe Top. Vacation is calling in this Fifth Label Sequence Stripe Top. Featuring a slim fit and square neckline. Pair with Fifth Label Sequence Stripe Skirt. Warmer weather ahead in the Fifth Label Pixel Stripe Shorts featuring a high elastic waist with tie. Pairs perfectly with the Pixel Stripe Top. It goes with everything! The black and white Fifth Label Striped Long Sleeve Top goes great with any bottoms! Warmer weather ahead in this Fifth Label Pixel Stripe Top featuring a one shoulder elasticated neckline with ruffle. Pairs perfectly with the Pixel Stripe Short.